Beppe Grillo’s Five Star Movement (M5S) is incrementally widening its lead over the ruling Democratic Party (PD) with a number of pollsters at present. For example, last night’s EMG Acqua survey for LA7’s news programme gives the anti-establishment party its best score of 2017 in this weekly series. M5S is now back to the level of support it enjoyed in the final quarter of 2016, when it was running neck-and-neck with the PD. The latter remains afflicted by its internal leadership contest and the breakaway of a left-wing group of deputies to form the MDP: having clearly led Five Star by three to four points in EMG polls at the start of this year, the position is now exactly reversed. There is little movement among the other parties, although it is worth noting that the Italian Left (SI), which was already struggling, has been at a very low level with EMG almost immediately since the MDP came on the scene in February. Fieldwork: 24.03-26.03.2017. Published: 27.03.2017. Participants: 1959. Methodology: Online poll. 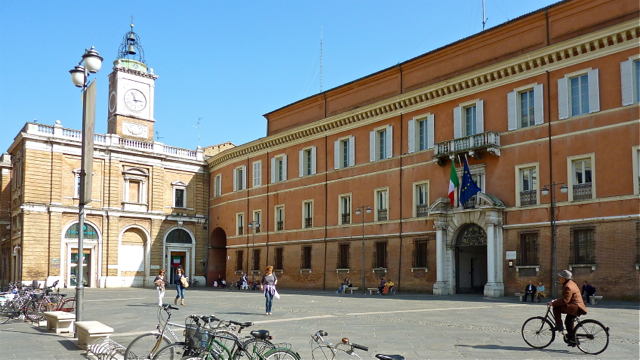 Image: Piazza del Popolo, Ravenna, Emilia-Romagna, Italy. Photo: Andrew Cornwell. All rights reserved.